Rental Car Assistance as the repairs are made to your vehicle! At Dabler Auto body, we use only the latest state-of-the-art equipment, so that we can offer the most efficient, highest quality, and most abundant services in the Salem area. Chief frame rack machines are giant straight edges that won’t bend or flex under pulling forces, which is important when you are trying to bring a damaged vehicle back into factory specifications. We can put tremendous amounts of force against a vehicle once it is secured. Detecting Misalignment in a Vehicle’s Structure -Whether detecting misalignment in a vehicle’s structure, or verifying repairs have eliminated the damage, the Vector computerized measuring system is an excellent tool. Vector integrates the precision of laser scanning with a computerized data base for unmatched accuracy in collision repair and analysis. In addition to showing extent of collision damage, Vector monitors progress throughout the repair and verifies the vehicle’s structure is correctly aligned. Three separate reports verify the vehicle’s structural condition by showing overhead diagrams that display center line, datum line and datum height measurements. This offers indisputable evidence that the repairs made were not only needed…but returned the vehicle frame to its pre-collision condition. The system’s electronic body scanner houses Laser Lights that reflect off of revolving mirrors toward light-reflective Targets (each bearing a unique code) that are suspended from a vehicle’s reference points. The Body Scanner houses photo sensors that identify the angle of revolving laser reflections. This information is transferred to the computer which performs the triangulation. Paint Booth- Nova Verta USA, located in Spokane, Washington, is the leading supplier of top performance automotive and industrial spray paint booths, prep stations and closed top open face paint booths. The last ten years has brought tremendous change and improvement in Nova Verta’s paint booth technology and performance. Nova Verta’s products have been designed to be user friendly for the technicians and owners who purchase and operate the equipment while maintaining the ability to adjust to continued paint product changes. Nova Verta leads the industry incorporating Total Control Technology. This technology features self-diagnostics, automated pressure control using variable frequency drive (VFD standard on all models); eliminating pressure control dampers. The Total Control System incorporates better control of paint booth pressure and airflow, and it provides maintenance reminders, ensuring longevity of the paint booth equipment. Additionally, a complete maintenance log can be viewed from the convenience of the operator station. The Total Control Technology conserves energy, lowering consumption by as much as 40% over typical booth control systems. Equipment updates are also made easier, through the use of an e-prom chip and/or PCMI card. Dabler Auto Body is a full-service collision repair and auto painting facility, offering a broad range of services for all makes and models. We are staffed by certified trained professionals who specialize in restoring your vehicle to its pre-collision state. 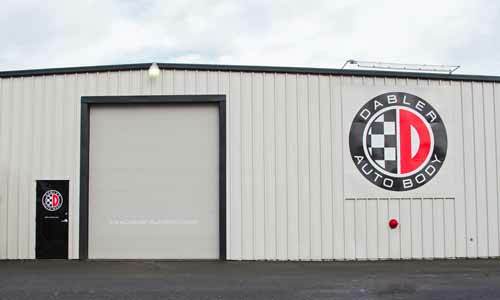 Salem residents know that Dabler Auto Body is the place to go for expert restoration and unmatched customer service that is a cut above the rest. Our ASE certified technicians offer the latest in state-of-the-art equipment to straighten the frame and unibody of your vehicle to factory specifications. We serve all makes and models, and are a Certified Repair Facility for both BMW and Mercedes-Benz. Dabler Auto Body’s expert technicians also specialize in R.V. repair and aluminum repair- no job is too difficult for our team! Our color matching specialists are trained to accurately match the existing paint on your vehicle for a seamless repair. We use cutting-edge equipment to match color and “bake” on the paint for maximum durability over the lifetime of your vehicle. We insist upon only the highest-quality parts and strive for results that restore your vehicle to its pre-accident condition. Dabler Auto Body has proudly been serving Salem for over 48 years. We have built our reputation for excellence upon quality craftsmanship, use of the finest materials and most advanced technology, and impeccable customer service. If you are looking for experienced professionals, quality repairs and customer care with a personal touch in Salem, contact Dabler Auto Body today at 503.585.0412, or schedule a collision repair. Being involved in an auto collision is a stressful experience, but finding an auto body shop with service you can trust shouldn’t have to be. When your vehicle has a small dent, door ding, or hail damage, there is another way to get your car back into shape without going through the ordeal of laying your car up at the body shop. Paintless dent repair can work on a variety of auto damage such as small dents, dings and creases, costing you a fraction of the price of body work and getting your vehicle back on the road usually in the same day. Dabler Auto Body offers the latest in paintless dent repair technology, so you know that you are getting quality care from pros who do it right the first time. Here’s how paintless dent repair works: one of our world-class technicians will first provide a free estimate, assessing the damage and determining if it can be effectively repaired through paintless dent removal, or PDR. 80-90% of all dents are able to be fixed through paintless dent repair. The dent will be prepared for repair once the technician has thoroughly examined the damage. The ASE certified technicians at Dabler Auto Body will use special tools to get a better look at the dent and apply slow pressure to the dent from the inside, pushing it back out to restore the exterior to its original position. The technician may remove trim pieces or inner panels to get to the dent, depending on the location of the damage. A special light board is used to see the shadows that are created by the dent, helping the technician to accurately push out the dent and create a smooth exterior. As the technician works, the dent will become smaller and smaller until it blends into the paint’s texture and virtually disappears. The entire process can usually be completed in just a few hours or less, depending on the extent of the damage. With paintless dent repair, the possibility of incorrect paint color matching is eliminated, since the PDR technique allows your vehicle to retain its factory-original paint job. Vehicles with original paint retain a higher value than vehicles that have been repainted. Keep the original paint on your car and get your car back to its original appearance with paintless dent repair. We work with BC Towing in Salem and can arrange to have your vehicle towed to our shop. Many towing companies will take your car to their yard after a wreck so they can charge storage fees. If we have your car towed directly to our shop, then you will not be charged any fees. The towing service is available 24 hours a day, 7 days a week, and 365 days a year. Light duty, medium duty, and heavy duty towing are available. Dispatchers are available 24 hours a day, 7 days a week. Serving the Willamette Valley including Salem, Keizer, and surrounding areas. Dabler has been repairing aluminum cars for years. Audi, Porsche, and BMW have had a long history manufacturing components made of aluminum, but only recently companies like Ford have started using aluminum. Like the new 2016 F150 all aluminum body, which has placed a spot light on auto body repair shops, and how to properly repair aluminum. Dabler Auto Body has been repairing Salem’s Fire Truck fleet formany years, which are almost entirely made of aluminum, so to us its just another repair! Special tools and welders are needed to repair aluminum, and Dabler Auto Body has you covered. When your automobile is with us, know that it’s stored inside at all times after hours. Our state of the are security has a proven record of keeping our 16,000 sqft shop and our customers vehicles safe and secure. Don’t let your vehicle become a victim of a shop with an outside lot surrounded by fence. We treat our customers cars like our very own.